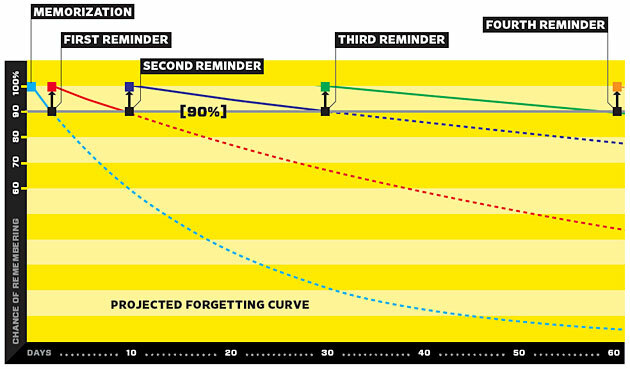 How accurate is this graph about learning curve and spaced repetition system? Is the axes and the lines accurate? When would the fifth reminder be? Browse other questions tagged learning long-term-memory working-memory short-term-memory or ask your own question. How do cooperative vs. competitive activities impact the learning patterns of an individual? What does cognitive science say about whether to learn mathematics top-down from research papers? How does the brains “focused” and “diffused” modes facilitate learning? Does studying flashcards, both front to back and back to front, decrease retention opposed to only memorizing one way? Importance of colors in learning process? Is there a non-interactive alternative to the concept of SuperMemo/spaced repetition? Why can't we learn what we don't like? Is practice more effective if spaced over time?